Thank you so much for subscribing to my newsletters to stay in touch with my blog! As a small token of my appreciation, I host a monthly giveaway just for my dearest subscribers. 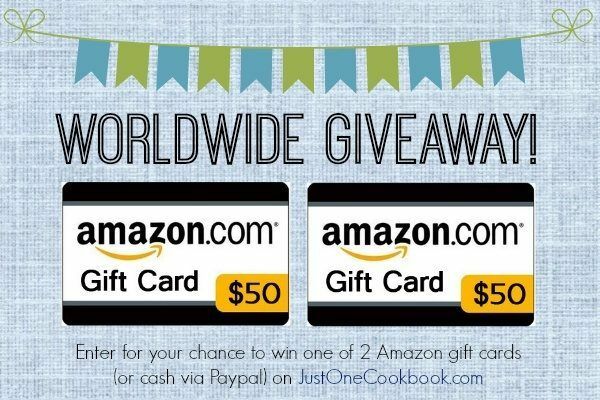 This month I’m giving away two (2) $50 Amazon Gift Cards (or cash via Paypal) and the winners will also receive a copy of my e-Book, Just One Cookbook – Essential Japanese Recipes. You can enter ONLY one comment per subscriber. This giveaway closes on Wednesday, September 30, 2015 at 12 p.m. PST and is open to participants worldwide (everyone!). 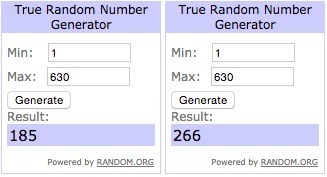 Two (2) winners will be selected via Random.org and contacted via email, so please include a valid email address in the email address entry box (please double check your spelling!). The winners are required to respond within 72 hours to claim the prize. Hello 🙂 Keep up the good work! Wow! More giveaways! I love your blog and your recipe is always delicious! Hello! Always love your recipes.. please continue making more!!! We like your honest authentic recipes…they are easy to follow and the taste is fantastic. Crossing my fingers one more time ✌?️? Thank you so much for the great giveaways and the awesome recipes!! ?? Hello! I hope to meet you in Tokyo one day! I love your blog. I am planning a trip to Japan next year and your site has been helpful in planning. Your recipes have been helpful for learning to cook Japanese food I love that you post pictures of the process. Love love love one cookbook!! Love your recipes & the clear directions but the listing of ingredients is not on the screen long enough for my 77 yr. old eyes! Thanks Naomi love all your work! Kitchen looking great so far. Can’t say the same for mine, it’s a cook’s nightmare! I have been trying your recipes for a while, my family loves them! I love and can’t wait to try your recipes. You make the recipes so easy to follow. Your kitchen looks great already. Hi Nami! Thanks for running this giveaway! I’m always excited to check out your new recipes and all the ones I’ve tried have always turned out successful. I want to thank you for your many super recipes. Hello! I’ve recently subscribed to your blog after stalking it for quite a while. I’m on a journey to a healthier and happier me and your blog offers so many good recipes that are nutritious and delicious! So glad that I’m following and have access to such great recipes!!! Hi! Thank you for your fruit popsicle recipe. I plan on making it for my daycare kids to celebrate one of their birthdays. What a great healthy, yummy, and cool alternative to cake. I am a klutz in the kitchen. But I had success with your recipe. Not sure why, maybe it’s your simple to follow instructions. My success (with your recipes) gave me the confidence to try out other recipes. So thank you very much! Hugs and kisses, from Kuala Lumpur, Malaysia! Hi! Kitchen is looking good! hello nami!! I love yr blog and have recoomended it to many of my friends. Keep up the good work! Dashi recipes should really come in a vegan version. You have many subscribers who can’t use bonito flakes,. Can you please furnish us with a good dashi recipe that does not include fish flakes? It would really be very much appreciated! Thanks! Try your recipe before and it’s easy to do and taste good. Hi! Loving your Japanese recipes! Would love to read more about the various types of Japanese ingredients and various ways to use them (eg. Shio koji etc). Your recipe’s are all awesome! I can’t wait to get started making your recipes!! They look so delicious! I live in Hawaii and love your blogs. I’ve made a couple of the ice cream recipes and your restaurant posts give me hints about where to eat in the Bay Area when we visit my family every year. Your website is awesome. I recently joined and I want to try all sorts of recipes . love your recipes. thank you for the offer! The kitchen is really starting to look amazing! Good luck and I can’t wait for the grand opening! I love this website. My house menu has never been so great. Awesome blog!! I just found your blog a few days ago, in FB actually, and lovin all of your recipes already! My partner and I are both japanese food lovers <3 <3 so having met your blog is perfect for us! Love your blog and videos and have made several dishes, and it’s fab. The instructions – with stepwise pictures – are perfect, so I can’t really think of any helpful to improve it further. I have one request though – can you start a section called – easy meals for one/two people? the thing is, the site helps non japanese cook dishes, but what about putting together a simple meal? what are the basic combinations of items – keeping in mind that it’s reasonably easy to assemble and the prep is stress-free too? if you do this, your blog would be absolutely complete. thank you so much, and once again, deeply obliged for all that you are giving us. Love your website and posts about Japan too, keep it up! i love your sable cookie recipe! so delicous! Love your recipes, and the chance to win something is such a bonus! I love this website. The recipes are so clear and easy to follow. Another recipe for side vegetables would be amazing! Love your blog! Such a great resource! Would love more recipes using Instant Pressure Cooker Pot. I can’t wait to try the ramen recipes, as well as the Japanese cheesecake! Japanese-style cheesecake has always been my favorite. Thank you for sharing your recipes! Your videos are awesome, too. We recently renovated our kitchen, so I can relate to the excitement you’re going through with yours. Another thing we have in common is we visited Shirakawa-go last November when it was covered in snow! It was so picturesque but your summer photos are just as gorgeous. I would like to request the cheesecake of Genki Sushi. That is my most favourite item there, you can search “genki sushi cheesecake hong kong” on Goggle to see the picture. It feels gelatinous and ice-cream like at the same time and it has a very thin sponge cake layer at the bottom. It looks like a no-bake cheesecake and probably not the best cheesecake for other people but that is just one of my favourites. So excited to see pictures when your kitchen is finally complete! Thank you so much for the giveaway and I love your recipes. I love japanese culture and I really love your recipes!! Looking forward to more and more of your yummy recipes…. Hello, you have a nice and bright kitchen. Looking forward to more wonderful recipes from you. Thanks a lot. More power to your food and trip blog! Thank you so much for the tours of Japan. Such a delight to travel with you via your pictures and journal. You are a talented young lady!! Hi, I like your recipes and the pictures. The pictures are so nice that they all look yummy. Great Job. I love all your recipes because they are simple and eay to follo …. I already tried the cabbage rolls and they were so delish … trying to find time to do the other recipes essspecialy the sushi and ramen recipes. Thanks. I love your recipes, as they always turn out so deliciously! Just wanted to say hello, and how much I enjoy your website! Your blog has helped me so much since moving to Japan. Cooking Japanese food really helps me to make friends. Thank you! Hi, it’s a fabulous giveaway. I want more recipes with matcha te. Loves your new kitchen ! Wish I’ll have something like yours someday. Hello, love your blog and your recipes. And the most important for me, since most of your recipes are so stomach friendly, with good quality ingredients and some fine seasoning, this kind of food seems to work very well for my Crohns stomach! I’m so grateful for every entry here on JOC. I learned about Japanese cooking from a couple of (Japanese) friends. Thank you for helping me continue to learn about and enjoy Japanese food! Anyway, still hopping that u can be my friend.. Can u make a easy and heathy vision of lasagna recipe? Love your site! And what will you do now that you remodel is complete?! Cook ? Yay! I haven’t been able to buy your book yet, so winning it would be even better. Nice to see that the renovation is progressing. I just wanted to say again what a pleasure it is to read your posts. This blog really is a wonderful resource for cooking (not to mention that it is the source of my partner’s favorite version of tamagoyaki). Hi Nami, I’ve been following your blog for a while but I’ve just signed up to the newsletter and I’m wondering why I didn’t before. Your kitchen is looking good! I love Japanese cooking and love your website – one of the best!! Your cooking inspires me to be more creative in my lunchbox for my kids. They bring their lunch to school, always looking forward to what little surprise I have in store for them. I’ve learned to use healthy ingredients that they don’t normally eat and transformed them into healthy snacks! Thanks for the inspiration! Your recipes online are the first ones I scroll through when in need of some advice or inspiration. I always end up very satisfied with the result too. So thank you!!! I am very excited about the possibility of you giving your take on the hida-miso dish. I was served it at breakfast a few times while in the area on holiday and it was the most delicious flavor explosion in my mouth. Ever! So please, pleeease publish the recipe for us mortals to try. 🙂 Thanks again and your kitchen is looking great! Love your recipes! Looking forward to reading more of these! Hi! I was wondering if you had any other dessert recipes to share, especially more refreshing ones for the heat of summer? 😀 I really liked the ones you shared that I’ve tried already. Tried the Tsukemono (Pickled Cabbage) recipe. It was delicious! – brought back memories of 60 years ago and times with my Japanese grandfather. He made salted cabbage which would be put on a bowl of rice with hot tea poured over it and sprinkled with soya sauce. That was a traditional Japanese night-time “snack”. Umm.. Rice, Tea & Salted Cabbage – all in one bowl! Just curious: Can you introduce some recipes which are low in sugar and salt, and not having too much oil? I’d like to prepare something for my grandparents. Thank you! Thank for your yummy receipe. You are my favourite cooking website!! I love your website! I grew up in Japan so if I start getting homesick, I can look at one of your recipes to make some comfort food. Thanks for the giveaway! I have just recently become a member of JOC and have thoroughly enjoyed receiving the recipes and videos. I am so happy that you are making it easy and simple for us amateurs in cooking, to be able to try new and exciting dishes that we wouldn’t have done in the past. I look forward to each new e-mail from you to see what new dish that I will be able to cook next. Thank you so much for your help. Keep the recipes coming. The kitchen is looking great! We’ve tried your baked tonkatsur and the torikatsu with the tonkatsu sauce and absolutely love it! My kids ask for it at least once every two weeks. Thanks for the recipe. Looking forward to trying more of your recipes. Supporting you always! Learned so much from you! Thank you…. Tried your stuffed cabbage recipe using ground turkey instead of beef and pork. It gave it a lighter taste which my husband and I liked.! Hi your recipes really taste authentic Japanese. Pls continue sharing God bless you? Aloha from.Hawaii! 🙂 Love all of your fantastic recipes! I so appreciate how you have links to the ingredients like Mirin! I was able to find it in the grocery store and I’m looking forward to making Oyakodon this week! Hello and hope to see your completed kitchen soon! Hi, I’m your reader from Singapore. Thanks for the giveaway. A very nice and great kitchen you have. Hope to see more recipes from you. Have a great day ahead. Hi thanks for sharing authentic Japanese recipes. Can you also post some of the Japanese vegetable side dishes? God bless? Hope the renovation goes well, can’t wait to see new recipes from you. loving your blog and all your wonderful recipes! Thank you, Nami, for all of your delicious recipes. Just love them! I know everyone is enjoying them. Aloha to you and your family! Thank you so much for sharing your recipes! I have made so many things from your website! Hello! Your site has always been my first stop for Japanese recipes, and whenever I have a hard time deciding what to cook for dinner! Being a university student, cooking can be quite a hassle especially when I’m tired, but your recipes are easy and refreshing, and the photos that go with the recipes always look so stunning and delicious! Thank you so much for sharing your wonderful recipes! Thank you for your great recipes! I look forward to trying new things for my family! The kitchen looks great Nami! So happy for u that the waiting is soon over ^-^ Genki de! I love to read through the newsletter I received from you to see the beautiful ideas which I need to cook. My favourite one is strawberry difuku. They came out nice & yummy by following your recipe. Thanks for sharing delicious recipe with all of us. May God bless you more. I find your videos very helpful and clear; thank you for the wonderful work you do! Thanks a lot for sharing delicious recipe with all of us. Keep up the good work. Will be happy for you when the renovations are done-yay! Hello! I’ve said this before but I loooove your blog. I try to come up with some recipe I want to ask you for but everything I can think of you’ve already done it! Great work! I’m so glad that the kitchen is almost finished so now you can try and experimenting new stuff. Hello, I love your website! I feel that the title “Just One Cookbook” is unique and gives inspiration to all cooks in at least investigate the recipes. hello, love your blog even I can not practice it yet, wish you give more simple recipe, thank you..
You give so many opportunities to win something fantastic~ I always knew that Japanese-stuff-related people were awesome by nature ? Love your recipes and videos! Can you make 茶碗蒸しをin a pressure cooker? My favourite recipe website! Always a hit with the family. Hello! I love your recipes, especially the videos! Love your blog. 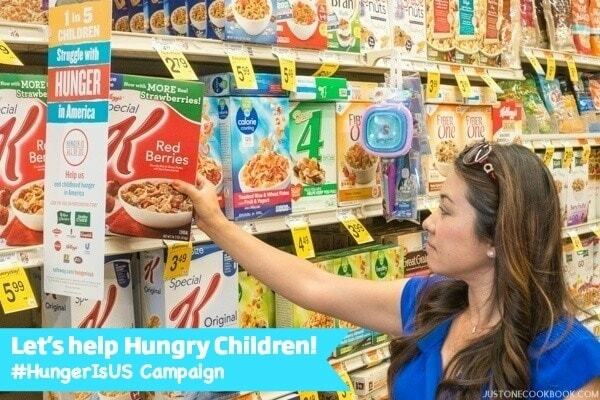 Please keep up with the amazing work!!! Hey, Nami! Thanks for the great recipes and videos! Your kitchen is looking good! I have always loved a big kitchen! Looking forward to see the end result. Aloha from Hawaii. I enjoy receiving your email and recipes. Keep up the great work. looking forward to receive more new recipes in your new lovely kitchen! Great giveaway! I’ll keep my fingers crossed. If I won the Amazon gift card then I could finally purchase the instant Pot that you wrote about to make that delicious pork dish. It has been on my wish list for some time! It would be perfect warm fall recipe as the temperatures are slowly but surely dropping here on east coast! In the meanwhile I will continue to use your recipes and videos to please my family! Thank you for starting this blog! You made cooking japanese food possible for me with your step by step instructions! Thanks for your hard work. Love the Recipies! I love your recipes – wanna to try them all, just wish I had the time! I love your recipes, just wish I had the time to try them all! Really enjoy your travel stories — and of course your recipes! Your new kitchen looks great already. Looking forward to your recipes. And you are local!! so I am enjoying your posts about eateries. The taste of your recipes remind me so much of my childhood when I grew up with my grandparents. Thank you! Thank you for posting your recipes up. They are wonderful! Amazing recipes and videos – you make Japanese cooking look easy enough that I want to try to make some! Hi, you have a great website! Hiya Nami! I’ve already subscribed to your news letter, and im dying to enter in the contest! I am starting to love these little giveaway’s! Melonpan and other type’s of japanese bread recipe’s. And i would love to request something like a authentic new year’s menu or christmas or something? I apologize if its already on the website! Also a request, to explore together on how to make Taiyaki without a special Taiyaki pan. I’ve been brainstorming about it because in my country there are no Taiyaki pans available. I’d love to come to an idea together for it! Love your efforts and try many of them (or bully my wife into fixing them for me). Your kitchen is really beginning to come together; looks awesome. Hi Nami. I love trying out your recipes. Just wish my family was as culinary diverse as me. Love all the recipes! I have recently become obsessed with Japanese pickles. Love your blog! I always thought Japanese cooking was too difficult but your recipes and direction make it possible. I look forward to new recipes to try. I am so glad that I found this blog once upon a time. After I came home from Japan, I missed the food terribly. Now I can enjoy it again, because I have found all my favorites here! Thank you! We love so many of your recipes and find them easy to adapt to our vegetarian lifestyle! Thank you very much for your fantastic site, and sharing your delicious, made with love recipes. I love your blog and your amazing recipes! Thanks for all the recipes! Looking forward to trying more this fall. Thank you for the recipes!! Hi, thanks for all your awesome recipes! This by far has been the best site I have found! My children love Japanese food and with my work schedule and their sports there isn’t much time for me to cook in between. The recipes on the site are simple enough and easy enough that even my kids love to help prepare dinner! Hi Nami! Thank you for all your tasty recipes and helpful tips! I love all of your recipes, pictures, and life blurbs. Your kitchen looks fabulous so far. I’ve always been intimidated by Japanese cooking so finding your site has been so helpful as you’ve shown how straight forward and simple it can be! I am loving the recipes and instructions, thank you! Your new kitchen looks fabulous! Thank you so much for your easy to follow recipes. More giveaways? You’re awesome, thanx! Love your recipes! Hope your kitchen project is finished soon; it looks great so far. Yayy.. More giveaways.. I love your recipe. Keep up with new recipe.. Thanks for sharing your delicious recipes! Hi Nami! Good luck with the rest of the kitchen project – Can’t wait to see it when it is complete!!! Hope we could enjoy more recipe from your new beautiful kitchen. Thank you for hosting so many guveaways. Hiya! I enjoy watching your cooking clips. They are very easy to follow and gives me inspiration for my own dinner menu. Thanks. one of my favorite blogs! Hi, thanks for another awesome giveaway. Your blog is perfect, don’t change anything! Recent subscriber but big fan, can’t believe the amazing effort and dedication that goes into running such a website, keep it up! Love your web site, especially the travel logs! Love the recipes you post! Love your recipes! Your kitchen is looking amazing! Thank you for the giveaway and great recipes. Love your blog! Having a Japanese mom & grown up in Japan, I miss all the Japanese foods! So it’s nice to be able to cook it on my own! After having Japanese exchange students here for a year, we are enjoying your recipes and posts! I love your new kitchen remodel. I love you site and recipes. I would love to see more desserts and meal options. Love the recipes that you share! Thank you for all your hard work! I am loving having you and your recipes to turn to after my first trip to Japan this summer. I would like to see some more recipes with veggies please! Two nights ago I made miso salmon and my family loved it! Hey Nami! Thanks for doing another giveaway. Just wanted to say I love the site and all the recipes, those I’ve made and those I haven’t yet tried! Your new kitchen looks awesome so far! You’re awesome! You’re food is awesome! Thank you! Can you provide recipes for a quick and easy Japanese bento? Enjoy all your videos and blogs. Love the recipes that you post. Alot of them are dishes that I grew up with up cooked by my grandma and mom. I’ve carried on the tradition somewhat and luckily, live close a big Japanese grocery store for my ingredients. Keep it up! I love your recipes and your giveaways too! Thanks! I’m making Hiyashi Chuka today using your recipe, can’t wait to see how it turns out! I’m not a professional cook, I love cooking and tried most of your recipes. They’re healthy food, excellent in taste and good for the body. My family loves it! Thank you for recipes! please provide recipes for a quick and easy bento, thank you! Enjoy your videos and blog! Great blog! Love all your recipes! I love Just One Cookbook! Great recipes! Your kitchen is coming along and will be great! Hello! Always find your site a pleasure to browse! Keep up the good work! Our family love your recipes. Keep up your great work. Love trying new things that you post. Yakatori was my last new one, great! So excited! I made your ice cream mochi and it was delicious! Love your recipes! And your kitchen redo! Hi! I’m really loving your recipes! Keep up the good work! You’re doing great!! This weekend I tried your Anko recipe – everyone loved it! It’s super easy and delicious, thank you for posting! Hi Nami, love your recipes! 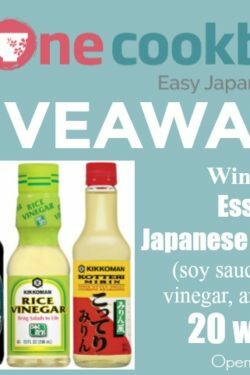 Wonderful giveaway and thanks for sharing all your cooking insights! Really enjoy reading. Thanks for your wonderful recipes, I have really enjoyed make them and shared with family and friends. I have also love to read your blogs. Hi I love your recipes! Thank you Nami for always being so generous with the monthly giveaways! I’ve tried a few of your recipes and they always turn out so yummy. I’ve also recommended JOC to many of my friends who were looking for inspiration for Jap food. I love your site! Please continue supplying us with wonderful and useful, informative content. I recently subscibed. I’ve made 3 recipes so far, They have been so fresh-tasting. I have a couple of other Japanese cookbooks since our granddaughter is in college in Japan, but without the videos we would not have seen exactly how easily these dishes go together. The most eye-opening one was the recipe for Udon noodles. I’ve made stuffed cabbage for years, but it was not nearly as good as yours. Adding bay leaves made all the differences. Watching your hands work makes the recipes seem possible to do. Thank you. Jaa mata. I am so happy about Just one cookbook site. I get to rivise a lot of my japanese recipes!!! Keep doing a great job with your site and recipes!!! I love it!!! I love your recipe sooooo much!! Waiting for more and more!! Love your blog!!! Always spend lots of time and having lots of fun browsing it!! your kitchen looks amazing so far!! I just found your blog last week when I was looking for a good recipe for hourensou gomaae. Thank you so much for having such a great blog!! Keep up the great work! Hello Nami, I enjoy your blog, especially the story that comes before each recipe. ? I am grateful for your website, blog and emails. I am gluten free and love asian foods. With your recipes and videos I am able to recreate some of the dishes I enjoy and not get sick. Great recipes! Love the mochi ice cream recipe !? Keep making more!? Hi, Nami. Your kitchen remodel is looking great. I know you will be glad to have it finished. Made your chicken teriyaki recipe last night, yummy! Hi! I can’t wait for your upcoming recipes! If possible, I would love to see some simpler recipes, that don’t include too many exotic ingredients, but is still Japanese. But, whatever you post, I’ll be waiting with anticipation! Love following your recipes and your travels! This would help with my Amazon Wish List. Thanks for sharing with us all this nice and useful recipes. I began following you when I find the recipe for japanese rice. From then on, I cooked some more elaborate recipes and have done pretty well. You’ve helped me remember the great time I spent in Japan. Thank you!! Love your site! Thanks for sharing all your recipes! Hi Nami, thanks for awesome giveaway. Your blog is such an inspirational to me. Thank you! i love your website and blog. keep up the great work. that shio koji chicken is unbelievable!! I am glad to have recently found your blog! My daughter is in Girl Scouts, and her cadet group decided to pursue their cooking badge this season. They’ve chose Japanese cuisine, so we are especially glad for your recipes with their step by step instructions. I can’t wait to see photos of your new kitchen. It may be coming along more slowly than planned, but it is looking very nice so far. Love trying out your recipes! How do you make Hokkaido sweet buns? I love your practical and fuss-free approach to cooking Jaoanese food! Always looking forward for your new recipes. Keep up the great work!! Enjoy reading about your trips. Thanks for the delicious japanese cuisine recipes. Look forward and enjoy reading your entries about Japan and Japanese cooking. I love what you share on your blog–the recipes and your current kitchen remodel progress. Thank you!!! Love your blog! my go-to for Japanese food and culture. Have you featured a shokupan recipe? Just found your site because I wanted to cook more japanese food (I used to live there) and love it, thanks for the recipes! Your chicken teriyaki recipe was a hit! I look forward to trying more of your recipes. Good luck with your new kitchen. Thank you for sharing great recipes! Good luck on your kitchen remodeling! Hi…I absolutely love your site! 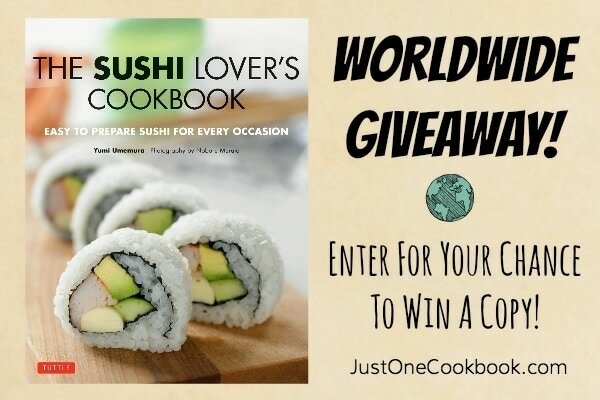 I can’t wait to try some of your recipes…they look easy to make and my husband and I love Japanese food. That Fruit Jelly recipe looks pretty easy and really good. I have got to get your book. Thank you for this site and all the recipes! Keep them coming! Nami ~ I share your recipes with my Yonsei, 4th generation daughters. You make cooking Japanese food fun and easy! Your photos are beautiful and videos are easy to follow! You are sharing our Japanese culture & cooking globally !! Thank you for all you do !! Arigato! I love your blog! I am 4th generation Japanese American but only recently started learning to make Japanese dishes and your blog has been so helpful! Thank you! Hello, your recipes are amazing! So easy to follow and tastes delicious. I enjoy seeing how you have adapted Japanese foods and seasonings to what we can purchase in America. Thank you for sharing your fantastic Japanese recipes! You probably have done this before, but I hope you share some New Years traditional recipes in December. My mother and grandparents are no longer around to share their New Years recipes, and it’s something I miss the most. I always look for tasty recipes that are or look simple to make. I also like your detailed instructions. Looking forward to the next newsletter. I loved your matcha latte and I am looking forward to trying more of your recipes! I love your blog and the posted recipes. Keep up the good work. 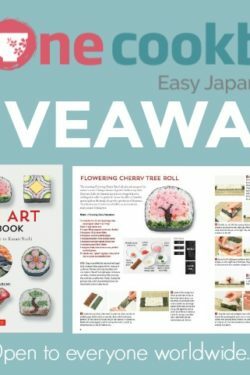 I feel silly as a fellow blogger to enter your sweepstakes.. But the sheer possibility of getting your ebook made me want to do it! Either way, I need to get it!!! thank you Nami for rewarding your subscribers in such nice ways! Heys! I enjoy your posts!? Love your blog! Was wondering if you’ve already featured a shokupan recipe? Just one cookbook continues to be my favorite site for recipes! Love your blog and I’ve been enjoying your kitchen updates. It looks beautiful so far! Love you recipes, just made the baked croquette yesterday and hubby loved it. Hello! My mother and I love your blog, we use lots of the recipes! We have a recipe request for onion pancakes (if you haven’t done it already!) Hope to maybe win this contest, good luck to all other entries too! I love your recipes! I’ve tried so many of them! Hello Nami. Chanced upon your blog one day when I was researching on how to make sushi rolls for my kids. Ever since then, I have tried some of your other recipes and they are yummylicious. My kids love watching your youtube videos on steps to cook the dishes too. Thank you so much for sharing and all the best to you! I love your blog. I just got back from a fantastic trip to Tokyo and am loving all things Japanese. Thanks for all the wonderful recipes. LOVE your kitchen! Mine is next! The email that linked me to this giveaway had a picture of a gorgeous kitchen! Your remodel looks amazing. Thanks very much for putting your fantastic recipes online that I could use to impress my family and friends! You are the best! Love the easy to read recipes..the pictures are inviting and makes you want to cook and eat! I would love a homemade recipe for Kuri kanroni! Everything is remarkable! Do you have a recipe for Namasu? Thank you for your wonderful website and for sharing your recipes. love your website. great info! I love most of the recipes, So Yummy !! with lots of valuable….. lessons…..
Hello! I enjoy your recipes very much. I recently discovered your blog and loving it! Thank you always for the great Japanese recipes. can we have more desserts please? Your website is my go-to for easy and delicious Japanese recipes! I made my grandpa your soboro-don and he loved it! Yes please I love your recipes!!!! Your emails always inspire our menu with new Japanese dishes! I love Japanese cooking and am lucky to have a huge Japanese supermarket not far from me, so getting ingredients is not a problem. I’m always looking for recipes. Your new kitchen looks fabulous! As always, I look forward to your posts! I love your blog and recipes so much, so just…hello! Love your blog! Thank you for sharing your recipes. My family is making your Chashu Pork recipe today! We are so excited – and the video is so helpful. My son can’t wait to have it in his bentou at school the next day! Thanks for sharing! Just want to say that I really like the recipes on your website. For a college student and an ardent fan of Japanese food like myself, the recipes are easy to follow and prepare, and they definitely taste yummy! Thank you Nami! I really like your recipe styles. Easy to read and follow. And ingredients are usually not complicated and easy to get. Just love it keep support your publish. Good works! So happy I found your blog …. I lived in Japan for 3 yrs. and really miss it , so getting your recipes and making them brings back wonderful memories ! Thank You ! So glad I found your blog ! I lived in Japan for 3 yrs. and really miss it . Cooking your recipes brings back some of my happiest memories ! Thank You ! I love your recipes and videos!! Hello! 🙂 Thank you for hosting the giveaway. Love all your recipes. Can’t wait to see your new kitchen after the remolding! Best of luck in the rest of the progress. I like your website , trying out some of your recipes. I want to win this time, Nami! 🙂 THANKS! I made the stuffed cabbage rolls and they were fantastic. Thanks for the complete instructions. I’m cooking Shoyu Ramen Broth right now and always find your website to be a great resource with all my Japanese recipes. Thank you Nami! Yay! Thank you for the giveaway. I’m having kitchen envy right now! I want to redo my kitchen so I’m getting lots of ideas. I really love the ease of the recipes. Thanks so much! thanks for that! keep following you! I would love to see soup curry sometime! I always just refer to your recipes whenever my family and I feel like eating Japanese food, which is OFTEN 🙂 … Thank you very much for sharing what you know, your videos really help a lot! I made your Kabocha Squash Soup recipe last night and I think it’s, so far, my favorite recipe on your website!!! So quick and easy to make – but soooo tasty. My boyfriend loved it too and he’s habitually not a big fan of quash soup! I even recommended the recipe to my coworker. Hello. Love the chicken adobo recipe you shared. Great recipes that are authentic but pretty simple! Would love to see a curry recipe with homemade curry roux! I’m a fairly new subscriber, so no requests yet. I have found many good recipes here I would like to try out though, so thank you! I love looking at the cooking videos you posted online! They make cooking look a lot more simple than what I used to think. Thank you! Ps- I know you focused a lot on Japanese dishes, will you be branching out more to other ethnic food dishes? Hello Nami! Thank you so much for the giveaways and great recipes! Your blog is amazing! Keep up the great work! Hello, loved your new kitchen! The kitchen is looking great! Can’t wait to see it finished. Your new kitchen is looking great! I’ve been wanting to do the same thing… maybe it’s time for an upgrade for myself as well. Keep up the good work! Le site est merveilleux, les recettes sont claires, simples et délicieuses. i was wondering, can you do more recipes using agar powder? I really enjoy your recipes, and look forward to sampling new ones. Spent 8 years in Tokyo, late 70’s-80’s and wanted to cook so many Japanese dishes, but couldn’t find cookbooks in English. 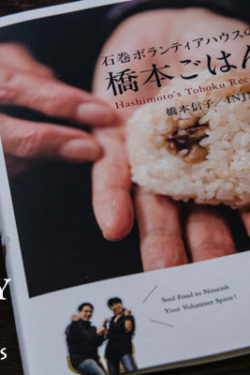 Have several Japanese cookbooks now, but find your recipes to be the absolute best! I’m cooking all those wonderful dishes that my husband and family enjoyed all those years ago thanks to you! THANK YOU! Waiting for your new kitchen! Can’t wait for your kitchen to be finished to see the final product! I just found this site and I have already discovered some recipes that I’m sure will be favorites! I’m so glad to have come across your website. My dad, who is Japanese, is living with us now so these recipes are a big help for me to make him authentic home-cooked meals. Thank you!!! Looking forward to your new delicious recipes! Hi Nami…Love your website! I use your recipes all of the time. Hi Nami! Love your recipes. I am so happy to be learning Japanese cooking! The kitchen is looking good. I’m looking forward to seeing the finished product! I love your recipes! Please keep up the good work! Can you please make some no flour healthy but yummy desserts? Thank you for all your great recipes!! I found your bento tips really helpful! Love your blog. If you have other recipes for the One Pot 7 in one pressure cooker that would be great! Thank you for not only sharing such wonderful recipes but also a little bit about your personal life. It’s always so interesting and fun to read about what’s going on with you and where you’re going! I love your website! So many great ideas and insights into yummy food! Congratulations on the kitchen remodel! So far it looks wonderful. I imagine that you cannot wait to be able to use it to create delicious meals for your family! I love your blog. Your recipes are tasty and easy to make. Good Luck with your Kitchen Remodel!! Looking forward to your new recipes! love your blog and recipes. Keep them coming. Thanks learn a lot from you. I enjoyed reading about your family’s visit to Yosemite National Park. I can’t wait to read part 2! I love your pictures. It was what drew me to your site. I love reading all the JOC posts. Keep up the fantastic work. I know you will be ecstatic when your remodel is finished. Can’t wait to see the finished room. Hi Nami! I really love your posts about your trips! Now, I have to go to Japan. Thanks! Hello Nami-san! Thanks for sharing your recipes! I do however have a request! =) I was wondering if you have a custard filling recipe you can share. I only thought of it because I saw your taiyaki receipe and I want to try to use custard filling since my boyfriend likes custard more, but all the ones I had found online were more for cream puffs and I wasn’t sure if they would go well with the taiyaki recipe. You have interesting recipes and the travel stories are wonderful! I love your site. I haven’t been able to try any of the recipes just yet, but hope to soon! hello Nami! love your recipes. Hi Nami. I’m excited on your new kitchen. I’m sure you’ll come up with more delicious recipes. We absolutely love your website and refer to your recipes regularly. I have a question you might know the answer to? In our Japanese market, I am confused when I pick up something as simple as Nori or furikake, that there is a sticker on the back saying that “this product contains chemicals know to the state of CA to cause cancer, etc. , etc., ” Especially with the Nori- there is only 1 ingredient, seaweed, so I don’t understand why that would be considered not healthy? Anyway, thanks for all the delicious recipes! And, your kitchen is gorgeous! I have started the path of Building Delicious and Beautiful Bento! Also, Hi! Hello Nami-san, thanks again for all the giveaway gifts beside your delicious recipes. Hey, love the recipes you post. I recently tried your salmon fried rice recipe. So bomb! I love your recipes!!! Thanks for sharing! More recipes and adventures to you and your family! Your kitchen is looking beautiful. Thank you Nami! We made your Slow-cooker Chicken Wings with Daikon tonight and it was fabulous! Oh, and my first miso soup with homemade dashi, so much better than instant. I look forward to when you get your new kitchen and can do new recipes again! I love your recipes! I would love to try making more traditional japanese sweets. Recipes would be appreciated! ?❤? Love your tempura recipe. So simple! Salted Salmon there are both so good. I have fallen in love with yaki udon…it is so quick and easy! I make it at least once a week. Also, korokke is very tasty albeit a little more time consuming than the yaki udon 🙂 I look forward to your recipes both in the email updated and on Facebook. Keep up the great work ma’am. Can’t wait to see what you’re going to be cooking up in your new kitchen! I love your recipes especially gyu Don and tonkatsu. I am not a skillful cook, but I was able to make a delicious meal for my family following your recipes. Thank you. My son loves Japanese curry. He is 2 and can’t take food that is too spicy. Can you teach us how to make that? Hi Nami…love your blog and recipes..thank you for giving giveaway…hope i can get one of those.?? I love your recipes with easy to follow directions. I made the onigiri and chawanmushi today for lunch and it turned out well. Keep up the good work. Hi 🙂 Will always be inspired by your passion in cooking! I would like a “simple & basic” tutorial on how to make maki sushi. Please! Thank you again for sharing your recepies. Cooking is so fun ! Have a good good day ^^ ! Would you have a good recipe for Ebi Tempura? My kids love ordering that in every Japanese restaurant we go to. I’ve tried cooking it at home but can’t seem to replicate it. 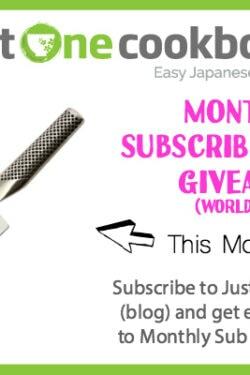 I may have missed it being a new subscriber but do you have a recipe for yakatori? I was stationed in Japan and remember getting at festivals and would love to try to make it. Thank you for all the wonderful recipes with detailed pictures and instructions! I’ve really enjoyed being able to recreate these recipes at home, since my husband and I really loved (and missed) all the wonderful food we had on our trip to Japan. I hope we’ll be able to go back sometime, but in the meantime its great to be able to have the same authentic foods in our home! Hi Nami! You responded to my question about Mapo Eggplant a little while ago, and I haven’t said thank you yet — so thank you! 🙂 I just got more eggplant from my CSA farm share yesterday, so I’ll make it tonight. Thanks again! And your new kitchen looks beautiful! Your kitchen is great! I’m sure you’re going to love it after all the unpacking and clean up! Hi There! I just made your loco moco, and I have to say, it was ono! We are from Hawaii so it tasted like home. So glad I can make homemade gravy now. I also love your curry recipe. Can’t wait to make the soba recipes this week! I’m a new subscriber and am already enjoying the recipes and information. I love how you include pictures in your recipe, it makes the recipe a lot easier to understand! I’m a fulltime OL, and I would like to see some easy and quick lunch/bento recipes 🙂 Thank you!! P.S. I’m originally from Kaohsiung, Taiwan, and I love seeing how much fun you had in Taiwan with your husband and kids! Really enjoy your videos and recipes. Please provide recipes for a simple Bento. Tried the bitter melon tofu salad…loved it! Every single recipe I’ve tried from you was a hit! Thank you so much for those and all of your giveaways! Good luck with the remodeling, your kitchen looks gorgeous. Hi! I love your blog 😀 I want some healthy recipe for this who workouts 😀 I started to diet but I want to eat something delicious not only salads and chicken breast ! Please consider listing the products you’re using – I hope to be remodeling my kitchen next year! Thank you for such wonderful recipes and the opportunity to enter you many Giveaways. Hi Nami, loving seeing the progress of your kitchen ? I love your recipes, they are so user friendly! Whenever I need a recipe, you are the go-to site before others. I love the pictures and how you simplify things. Keep up the good work!! Hello! Love your blog and récipes! Kitchen is looking better all the time, bet you are getting more excited by the day! Hello. Do you have a recipe for a crunch roll? I really love this website! I’ve always had a love for Japanese food and h always wanted to learn how to cook it myself. Thanks for sharing the recipes. Hi Nami! I really love your simple, easy-to-follow recipes. The design of this site is very clean and nice too! Thanks for the giveaway. I would to know if you have a recipe for tsukemono . I’ve seen several recipes in cookbooks but looking for a recipe with NO monosodium or adjinomoto in the tsukemono . Please i love eating tsukemoto with hot rice , but sensitive to MSG due to migraines. Ido love your recipes . Love your kitchen restoration, so bright and airy. Always look forward to your emails, new recipes and your travels. Thanks for all the new recipes! Love the gelatin fruit! Maybe it’s my turn to win? Crossing my fingers!!! Made your clam pasta recipe tonight with Venus clams. Added zucchini and butter too. It was a big hit. Yum! Thank you for your easy-to-follow recipes and techniques. We didn’t get any sand in the clams because we followed your degritting instructions. Yay! Thank you for sharing all these recipes! I love trying them out, and my family loves eating them! Thank you for your amazing website! There are so many of your recipes I still want to try. So far, the best luck I’ve had is with your chicken curry recipe, me and my fiancé just couldn’t have enough of it! I love your recipes! Thank you so much to share with us!!! Everyday I wait a new post in instagram! Hi, thanks for all the great giveaways, and the wonderful recipes. Hi Nami! Thank you so much for your recipes! I’ve recently cooked a four-course meal following your recipe and my friends loved my cooking to bits! Do you happen to have or know of a reliable recipe for miso tare for yakiniku? Our local supply has disappeared and I’m looking for other possibilities. Hello! Thank you very much for the great recipes and the clear instructions. I love your recipes, they’re really easy to follow (even for beginners) and absolutely delicious. Just made chashu with your recipe, and i really love it! I love your website. The recipes are easy to follow. I love your recipes. Keep doing what you do. Best wishes on your kitchen remodeling project! Thanks for all the awesome recipes and giveaway opportunities! Keep up the good work! Love your dishes!! Made all the cooking so much easier..especially for a working mum with 2 little monsters…thks!! OMG it looks like it’s going to be gorgeous. Mine is a freaking nightmare. I hope when I move (soon) my kitchen will be awesome. What I share with many of my friends who also love to cook is the techniques you share that I’ve yet to find in cookbooks! Specifically, in making homemade dashi to boil Kumbo NO LONGER than 6 minutes! Hi! I love Japanese food and your take on many dishes has raised a few smiles in my family! Thanks Nami! over the last 2 years I have often used your wonderful recipies and delighted my friends and family. My boyfriend especially loves your shoga-yaki and omuraisu. I am grateful for your wonderful fotographs, the step-by-step instructions and pantry explanations. And I am looking forward to all those new dishes to come! Hello! Thank you very much for sharing with us your simple , easy. yet delicious recipes. Looking forward for more exciting recipes to come. Thank you for all your recipes. Some recipes are so nostalgic, I remember my mom making these dishes. I have long forgotten about some of them. Thanks for bringing them back into my life! Hi, been following for a while n like most of your recipes. Hi there, the japanese also have lots of nice desserts. Maybe you can share some cakes or pastry recipes. It would allow followers like us to dish out a simple yet elegant full course dinner or lunch for guests. Best wishes with your new kitchen. Loved you blog on Takayama. Brought back wonderful memories of visiting Japan and my son who was studying at uni for a year in Osaka and also spending time with his partner and her family in Wakayama each weekend. Loved our trip to beautiful Takayama and the amazing food everywhere. I love your matcha latte and I’m looking forward to trying to your other recipes! Hi! Enjoy the newsletters! Thanks! I just love your recipes and your blogs! Recipe request-black sesame pudding please! A friend recommended your site, and I am really enjoying your recipes. Thank you! Looks like your kitchen is coming along and looking fantastic!!! Hi. Enjoy reading your posts!